SRAM eTAP – Wireless Electronic Shifting is Pretty Cool! OK, It’s not as spectacular as landing two rocket boosters simultaneously, but I think SRAM’s eTAP wireless electronic shifting system is pretty cool! SRAM came out with their eTAP wireless shift sytem in 2015. But I’m a Shimano guy, so I planned to wait for Shimano to offer a wireless system. My Tarmac SL3 is not set up for internal routing, so Di2 with all the wires doesn’t work for me. Well, this Christmas I got a wild hair and put the SRAM eTAP upgrade kit on my Amazon wish list. My wife got it for me! So I guess she does love me. Today’s post is kind of a product review, but I plan to hit the more esoteric aspects of eTAP. I don’t want to be just another DC RainMaker. Here’s a professionally produced video by SRAM that will help you understand my commentary. I recommend you watch it now. There is a flipper behind each brake lever, pretty much like SRAM’s DoubleTap. Click the right flipper to shift to a smaller rear cog, click the left flipper to shift to larger rear cog, click them both together to change chainrings. That’s all there is to it. There are no other options, but I’ll bet SRAM is working on custom configurability via firmware, just saying. Oh, you can buy “blips” to mount on aero bars or wherever; they simply mimic the flippers (and they are hard-wired back to the levers). And there is a “blip-box” aero-bar version. Setup truly is simple. Sync your shifters and derailleurs by pushing the buttons on each device (rear derailleur first and last). You don’t even need a bike. This makes for great fun at parties. Hold a shifter in each hand, place the derailleurs on the coffee table, and make them crawl like the robot in the final scene of Terminator 1. Brief rant: SRAM’s instruction manual contains instructions in seven languages. OK, fine. But on each page appear a few lines of instructions in all seven languages. Come on, technical writers! Don’t make me thumb through all 58 pages of the instructions. Just point me to the English section and let me read the relevant 8 pages. Anyway, you bolt on the derailleurs and do most of the adjustments without a chain. You don’t even need to have the shifters mounted on the bike. My shifters were laying on the workbench. Adjust the B-screw to get the right gap between the largest cog and the upper jockey wheel (6-8mm). On the front derailleur cage there are engraved index marks that you line up vertically and horizontally with the big chainring. Install the chain, then fine tune the rear derailleur by pushing some buttons, and that’s about it. The front derailleur knows the rear derailleur’s position, so it trims after each shift as required. That’s pretty cool! The battery condition indicator lights on each derailleur and lever are supposed to turn yellow and then red as battery charge declines. I’ve ridden over 1000 miles and I’ve got nothing but green lights. The derailleur batteries are interchangeable. This allows some clever dead battery recovery options which will be left as an exercise for the reader. An extra battery may be a good idea for an extended tour. The charger is a USB powered device, so a solar charger or USB power pack (which you’ll no doubt carry for your smartphone, IPad, etc.) would probably be handy if you’re camping. When the bike is moving, motion sensors turn on the derailleurs to listen for a command. So putting the bike on the back of your car and driving six hours is like riding six hours. This is why you should remove the batteries during transport. The derailleurs go to sleep when the bike is static to minimize battery drain. You are also supposed to remove batteries for storage. I can’t figure out what constitutes storage? A month? A week? Overnight? Does anyone out there know how much power is required to operate a motion sensor in sleep mode? I’m thinking FitBit Zip, and I’m thinking – not much, but I don’t know. Here’s something to think about. 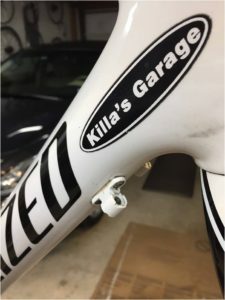 If you live on a houseboat or right next to train tracks, or if you store your bike leaning on a washing machine or something, the vibrations might prevent your derailleurs from going to sleep. What about the batteries in the shift levers? I think this part of the system design is cool – The levers are just little transmitters. They send a coded signal to the derailleurs with each click. They use power only when you click them, like a garage door opener or a key fob. So the little 2032 watch batteries in the levers are said to (and easily should) last up to two years. If you’re heading out for a critical ride and it’s been a year or so, consider proactively changing the shifter batteries. This is not something you want to do on the side of the road. I may just change mine once a year when I change my smoke alarm batteries. That reminds me, I didn’t change my smoke alarm batteries this Christmas. Oops. One annoying feature of the system for me was not being able to check front chainring selection with the levers. I know, just look down at the crank. But sometimes I’d rather not. With a Shimano mechanical system, I would push the left lever as if to shift to the big chain ring, and if it didn’t move I would know that I’m already there. If it did move I could continue pushing to shift or back off and stay on the small ring. The binary nature of the eTAP front shifting (push both flippers, it shifts) means you must change position to ascertain position. Then if the position you wanted is where you were, you are no longer there. Did that make sense? Notice I said “was”. I learned that the system can transmit gear position information to my Lezyne Super GPS unit. So now I can glance at my screen and tell what gear I’m in. Anybody remember the Shimano Flight Deck computer with on-screen gear indication from the Flight Deck shifters? It’s kinda like that but the info comes from the derailleurs, not the shifters, and wirelessly. And rather than a graphic representation of the cassette, a numerical position is indicated, e.g. F 1 / R 9 means small chainring / cog number nine of eleven. …but then again, Musk’s center booster crashed into the ocean! You can hold a shift button down to run through the gears, but you can also click as fast and as many times as you want. I have not felt a need to use the “multi-shift mode”. Contrast this with mechanical shifting where the two or three gear shift option is pretty handy. You do realize there are still brake cables, right? There is a long cage version called WiFLi that can handle up to a 32 tooth cog. The standard short cage version handles up to 28 teeth. You can shift the derailleurs by pushing the buttons on the derailleurs themselves. This is very handy on the repair stand, where you’d need three hands and long arms to reach both flippers and turn the crank to shift the front derailleur. Pro mechanics are said to be temporarily pairing a blip box to the bike and using that to shift on the workstand. The eTAP Upgrade Kit contains two derailleurs, two shifter/brake levers, two lithium ion batteries, a charger, a firmware update dongle (though there have been no firmware updates published), brake cables, and a few mounting bolts and other small bits. It comes in about twelve pounds of packaging, I kid you not. I have found the Upgrade Kit to be completely compatible with my Shimano crank, chain, cassette, and brake calipers. Now I just have to decide what to do with the shift-cable stops on my downtube. 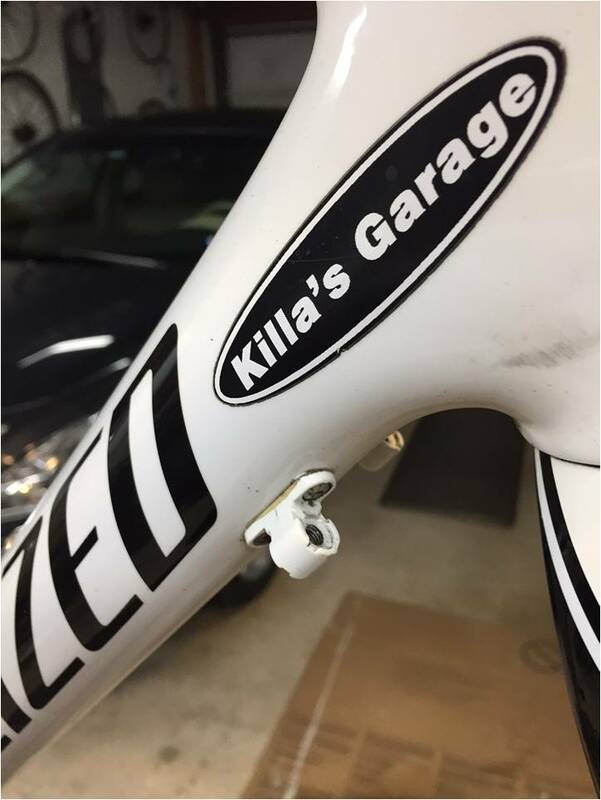 Author KillaPosted on February 18, 2018 4 Comments on SRAM eTAP – Wireless Electronic Shifting is Pretty Cool!